Japan has released the Leading Indicators, Average Cash Earnings y/y and Household Spending y/y. The US will publish Consumer Credit m/m, IBD/TIPP Economic Optimism, JOLTS Job Openings and Mortgage Delinquencies. The support rests at 111.110 with resistance at 111.470 which the weekly pivot point at 111.400 is located in between the lines. The EMA of 10 is moving horizontally in the horizontal channel and it is above the EMA of 200 and below the EMA of 100. The RSI is falling towards the oversold area, the Stochastic is showing downward momentum and the MACD line is below the signal line in the negative territory. The ADX is showing sell signal. 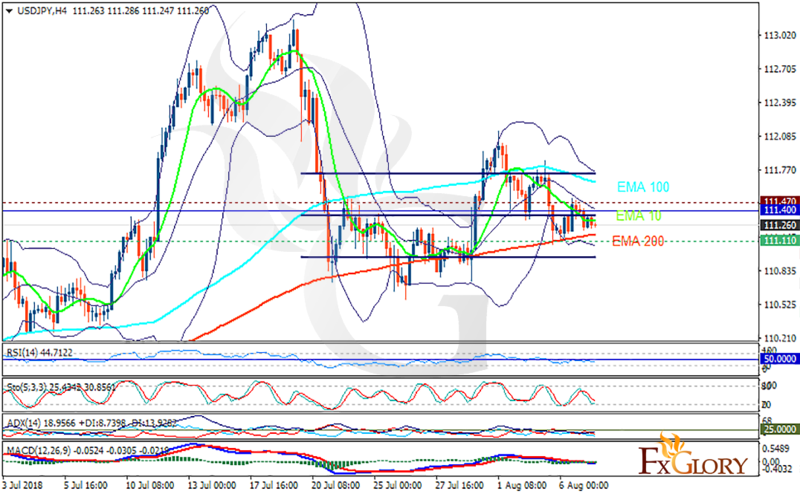 USDJPY may decline towards 110.8 but this level will remain the floor of the market. Bulls will take the control of the chart afterwards.